I may not be a Star Wars expert, but I'm a damn good shopper! With the new movie Star Wars: The Force Awakens set to be released December 18th, it has fans craving gifts to reflect their passion. The great part about Star Wars themed gifts is they don't break the bank! 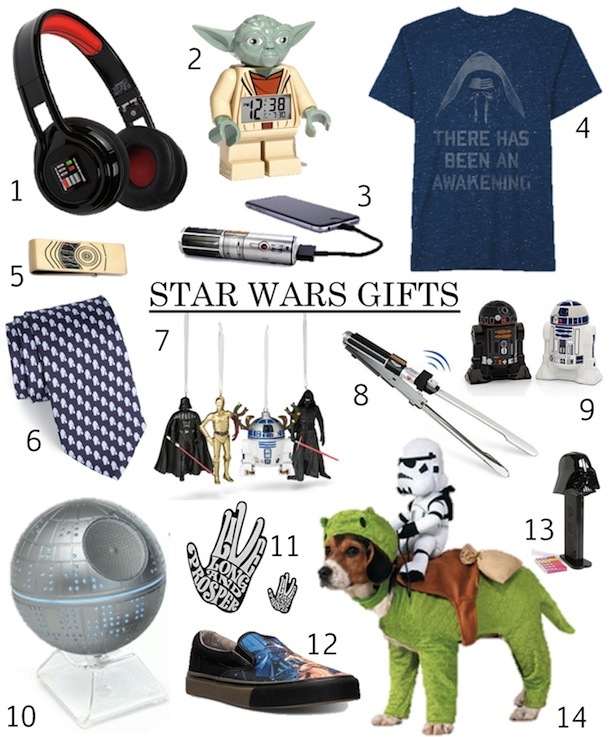 From iPhone chargers and bluetooth speakers to BBQ tongs and salt & pepper shakers to clothes for men, women and dogs - there is something for every Star Wars lover on your holiday shopping list! Check out more Gift Guides including Fitness Gifts, Gadget Gifts, Stocking Stuffers, Home Decor Gifts HERE. OMG! 14 is HILARIOUS! Hahahaha...I want to buy that for my brother.